Using techniques similar to package design and dressmaking, we will explore a multi-layered approach to slab constructed functional ceramics in this one-week intensive class. Technical and aesthetic aspects will be considered while exploring closed and open forms including boxes, bowls, platters and cups. Participants will be guided through the process from initial drawings to pattern design, using paper and roofing felt, to assembling components. Surface treatment will include the use of slip, sgraffito, stencils, and both familiar and unconventional tools to achieve visual and tactile depth. As the week progresses participants will discover how various techniques may be integrated into more complex forms. Lively discussion, queries and interaction with one another will be encouraged as we learn to personalize our work using the methods presented. The week of hands-on activity will be punctuated with lecture-demos, a slide presentation, and opportunities for one-on-one instruction. We will work with terra cotta clay, and an end-of-week demonstration will address post-bisque processes including staining, underglazing, and glazing. Handouts will be provided with formulas for low fire slips, stains, and glazes. Participants will leave the workshop feeling competent in a number of forming methods and will take home green and/or bisqued ware. Basic knowledge of clay is recommended. Beyond that, students of all levels will find new techniques and challenging processes to bring to their work. Lisa Pedolsky creates handbuilt functional ceramics in her Two Fish Studio in Southwest Colorado. Her involvement in art began in her native New York City. Its wealth of cultural and aesthetic diversity brought inspiration and led to her pursuit of art from an early age. 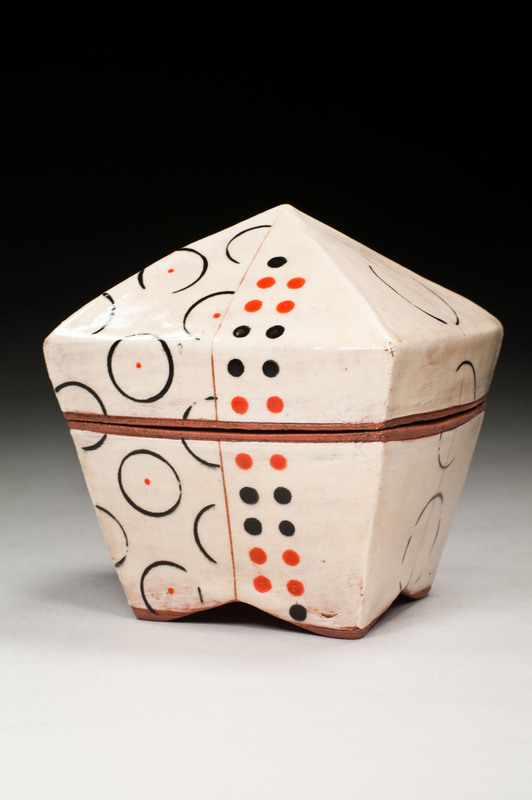 Recognizing a passion for clay, she immigrated to California in the early seventies, where ceramics had seen a radical transformation as an art form in the decades preceding her arrival. Her formal education took place in the Bay Area where she studied ceramics and fine art at California College of the Arts, Oakland (then California College of Arts And Crafts) and at U.C. Berkeley, where she received her B.A. in Art in 1977. Images and articles about Lisa's work have appeared in numerous publications, including Lark Books' 500 Vases, and in Pottery Making Illustrated, as cover and featured artist. In 2013 she was awarded NCECA's International Residency Partnership in Chile, where she will spend four weeks at Centro de Arte Curaumilla. Lisa teaches workshops and presents lectures at colleges and art centers. Her work is shown in galleries nationwide and has appeared in numerous juried and invitational exhibitions. The slab constructed functional ceramics I create are a reflection of my interests in innovative design and impeccable craftsmanship. Surrounded by mid-century modern design during my youth, I developed a lasting appreciation for beautifully rendered functional forms, from furniture to household objects. In later years I became intrigued with traditional craft and textiles coming out of Africa and Japan. My aesthetic is an amalgam of these deep-seated influences - modern and traditional, rustic and refined. I am committed to ongoing investigations into compelling design and technical mastery as they relate to form, decoration, and function. While the works I create are recognizable – a box, a bottle, a bowl – they are intended to evoke a deeper response, whether by revealing my sources of inspiration, offering an opportunity for aesthetic contemplation, or providing the deep satisfaction that comes from interacting with thoughtfully crafted objects.